Whose forests are they anyway? Our friend always says that. Well, a tour with a local logging company last weekend proved they belong to all of us. Western Forest Products conducts a free forestry tour every year. It is part of a larger celebration of our country's forests called National Forestry Week. As one of our greatest natural resources, it was interesting to learn how it is managed, protected, and enjoyed. The tour was led by Stuart and Nancy from Western Forest Products Sillwater Division here in Powell River. Two buses and drivers from School District 47 took about 75 people on an activity and information packed day. We learned about working and playing in the Working Forest. We learned about forest forest management for sustainability, planning, seedlings, stock types, and partnerships with local organizations in an Advisory Group capacity. We even got a short hike on the Sunshine Coast Trail that passes through their tree license area. Lunch was at the Horseshoe Lake Powell River Canoe Route campsite, also within the working forest. The afternoon was the highlight for me. In addition to stopping at the Lois Lake Fish Farm, we got to witness active harvesting and windfirming (protecting remaining trees from wind damage). Tilt Contracting and Oceanview Helicopters were on hand to demonstrate using their big machines and chopper. Thank you to Western Forest Products for this annual even to give back to the community in which they operate, and for taking care of our forests for now and the future. 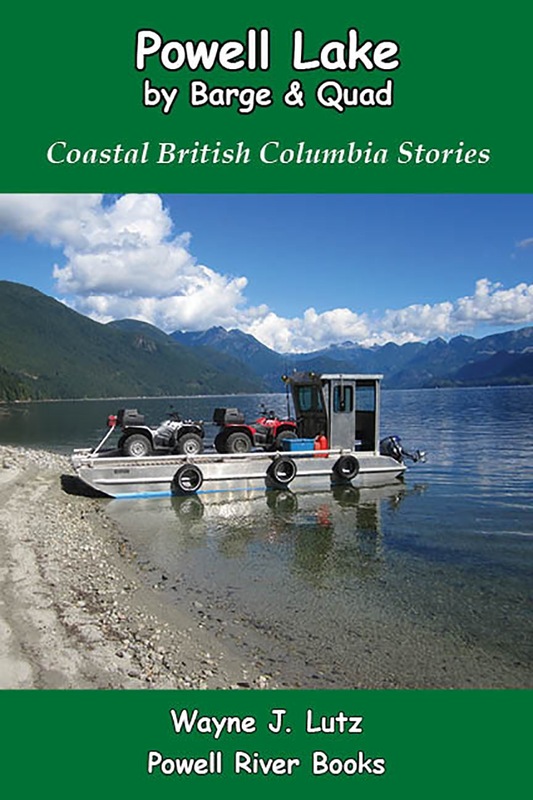 Ferns and Fallers is a publication by Powell River Living Magazine that highlights the partnership between the logging and recreational communities in and around Powell River. Aerial yellow jacket nest on granite wall. What's a summer BBQ without a few uninvited guests. They come dressed in their yellow and black jackets, ready to dine on your hamburger. I'm not talking about Cousin Willy and his kin. I'm talking about those pesky yellow jackets. Here in BC, the aerial yellow jacket (Dolichovespula arenaria) is a common summer visitor. Warm spring weather awakens mated queens from their winter roosts to find a likely spot for a new nest. Aerial yellow jackets build large conical structures out of paper they produce by mixing saliva with chewed wood, much like paper mache. The beginning of a new nest. Typically nests last only one year. All of the activity ends when fall weather turns cold. Workers and males die off and only the mated queens survive. This makes late summer and early fall the worst time for encountering wasps. Their population is the greatest, and foraging for natural foods becomes more difficult. That's when they turn to human sources, creating conflicts. Tools for a hidden nest under the cabin roof. The good news is that yellow jackets aren't aggressive unless they or their nests are threatened. Accidental encounters can create dangerous situations. Individuals with allergies to wasp stings must take extreme care. Multiple stings can also cause medical emergencies. John helping us get rid of a hidden nest. This year we had two nests. 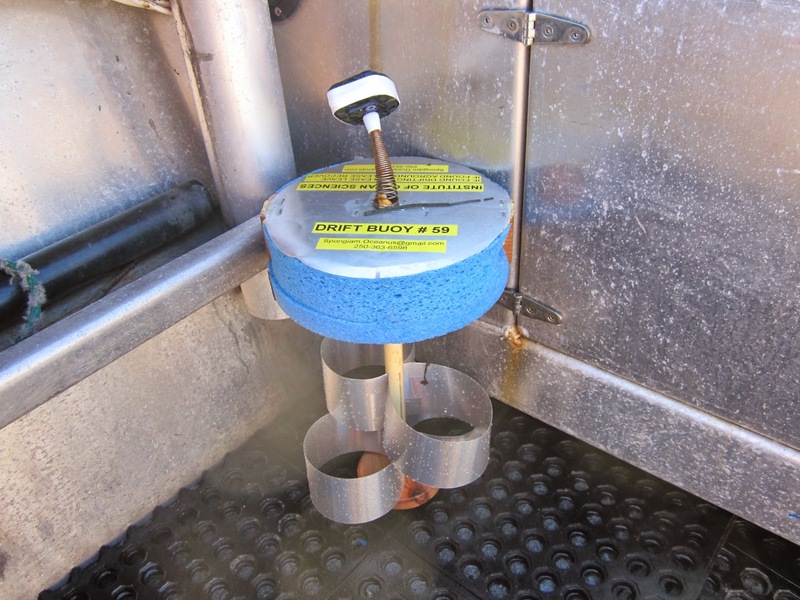 The easiest to eradicate was on Wayne’s writer’s retreat boat. A heavy spray of wasp killer in the cool of the evening took care of them. The ones that moved into the space under our roof were harder to reach. John gave us a hand and went up a ladder, sprayed the spot with a heavy dose of poison, and sealed the opening with moulding to prevent future colonies. Each year I grow onions in my float garden. It's one product I can "preserve" without much effort: grow, pull, dry, hang, and use. I plant yellow onions from sets. They grow larger and save longer. But every year I have a problem with onion maggots, especially if I leave onions in the ground past mid-July. This year I tried an "old wives tale" to grow some late season onions. I read that using wood ashes on the soil could help deter the pests. Onion maggots are the larvae form of gray flies. Pupae overwinter in the soil and emerge as flies from May to June. Flies lay their eggs at the base of onions, then the maggots that hatch bore into the onion roots. This cycle repeats itself several times a year. Crop rotation helps, but once the cycle begins it's hard to break. One organic recommendation is to apply wood stove ashes to the soil to deter egg laying. I figured it was worth a try. I sprinkled ashes over the plot for my onions. I moistened the ash to keep it in place. I then planted the onion sets. Each week I applied additional ashes until the plants were well established, and then after each rain. When I harvested my onions there were fewer plants destroyed by maggot infestation, and over three quarters were maggot free. Of the remaining plants, many could be salvaged for immediate use by cutting away one or two invaders. I'll try it again next year with my early crop and see if the results are as promising. Wayne has always been interested in science. Guess that comes with being a physic major in college. One day this summer, we happened upon a University of British Columbia oceanography boat in Powell Lake. Lake? Oceanography? They don't go together. But in this case they do. Powell Lake has prehistoric sea water trapped at the bottom since the ice age. Mark is a postdoctoral researcher at UBC. 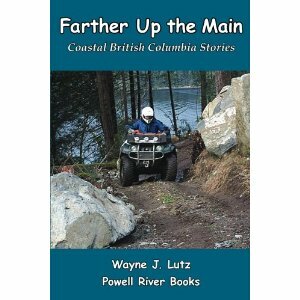 Wayne met UBC Professor Rich Pawlowicz and started thinking about writing a book about the Strait of Georgia. Not a science text, but a book everyone could enjoy. 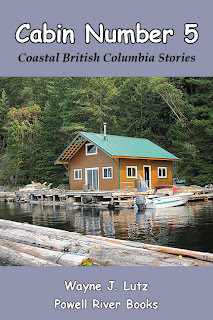 He would use the same model as his other Coastal BC Stories books, but this time learning from oceanic experts. Mark with a retrieved drift buoy. 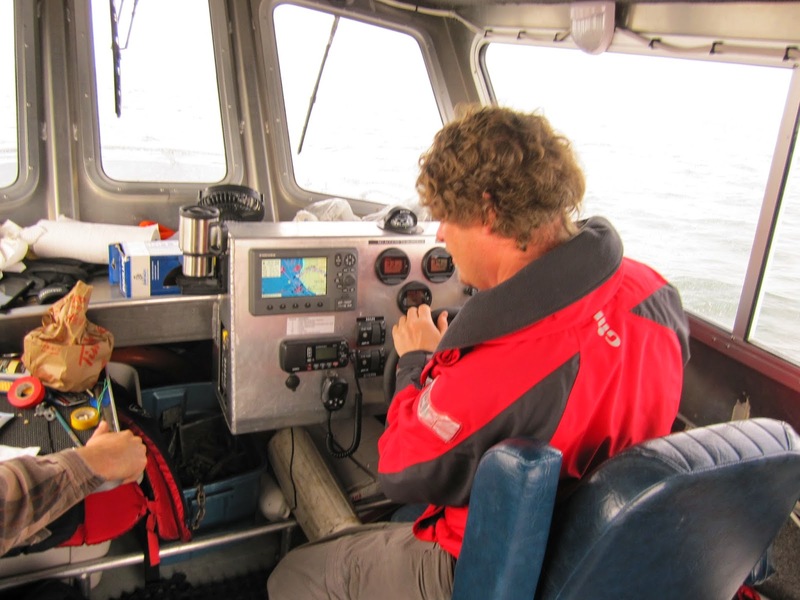 Last weekend, Rich coordinated an opportunity for Wayne to go out in the Strait of Georgia with Chris (the boat driver) and Mark (the postdoctoral researcher) on the 22-foot UBC research boat. 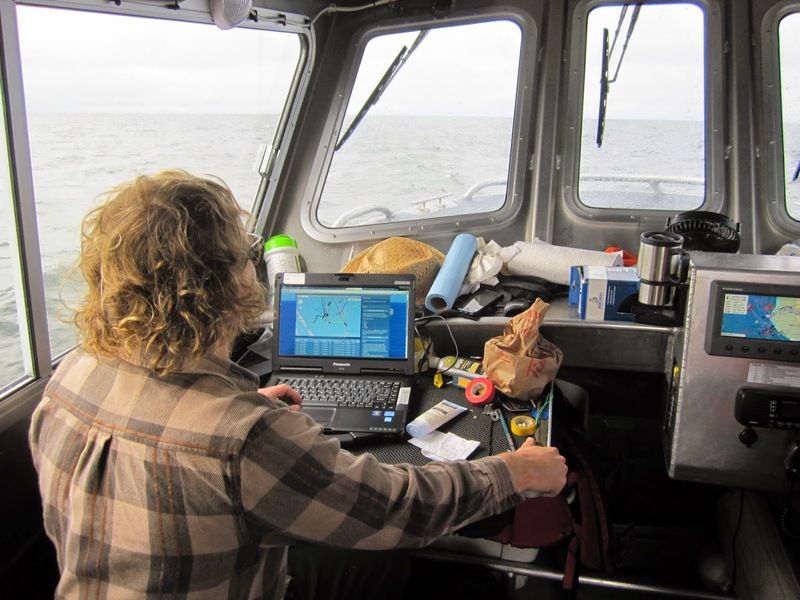 At the same time, Rich would be coordinating the project from the Canadian Coast Guard offshore oceanographic science vessel called the Tully. 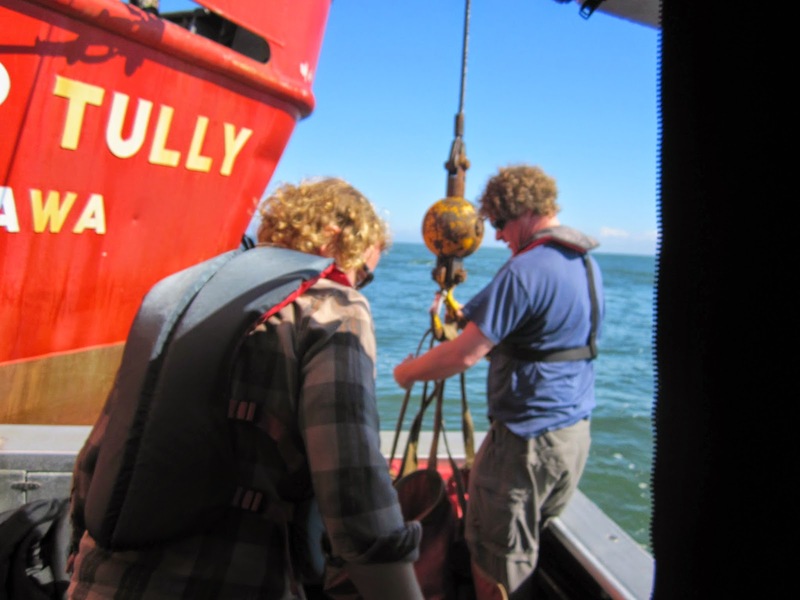 The days work was to retrieve and deploy drift buoys. Dropped at the mouth of the Fraser River, they quickly move around with wind, tides and river water flowing out into the ocean. 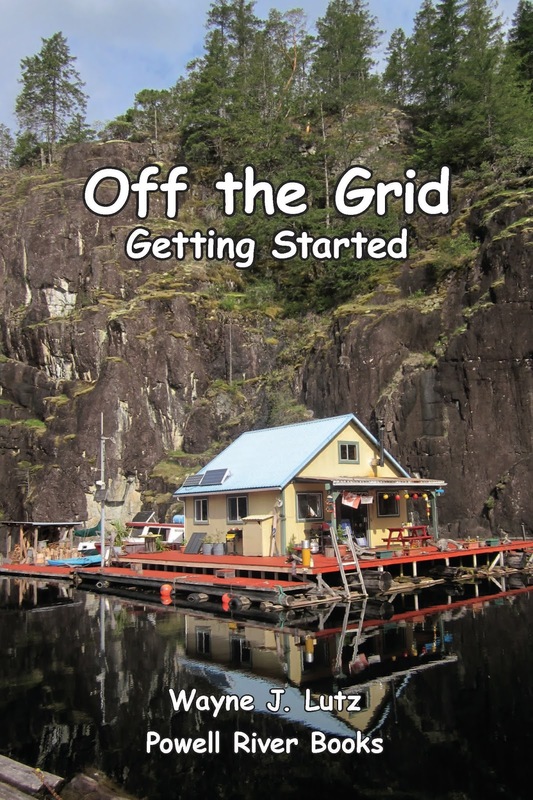 GPS, satellites, and cellular Internet make intricate tracking possible. Transferring equipment alongside the Tully. Wayne said coming along side the massive ship to transfer equipment was exciting and scary at the same time. A large crane lowered a sling down to the hovering UBC boat. The seas were choppy, but on the lee side of the ship it was much easier to stay close without colliding. 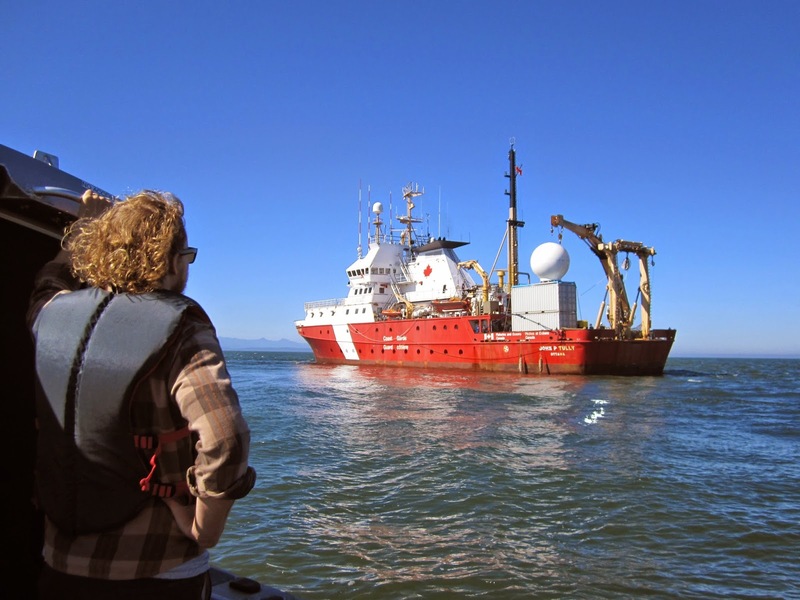 Meeting the Tully at sea. Fall is here and it's time to think about cooler evenings and wetter days. Last year we made a simple porch enclosure from greenhouse plastic so we could continue to enjoy our picnic table. With a propane heater, we ate outdoors most evenings. The problem was that we really couldn't see through the plastic all that well. We decided to have a professional model made for this coming season. 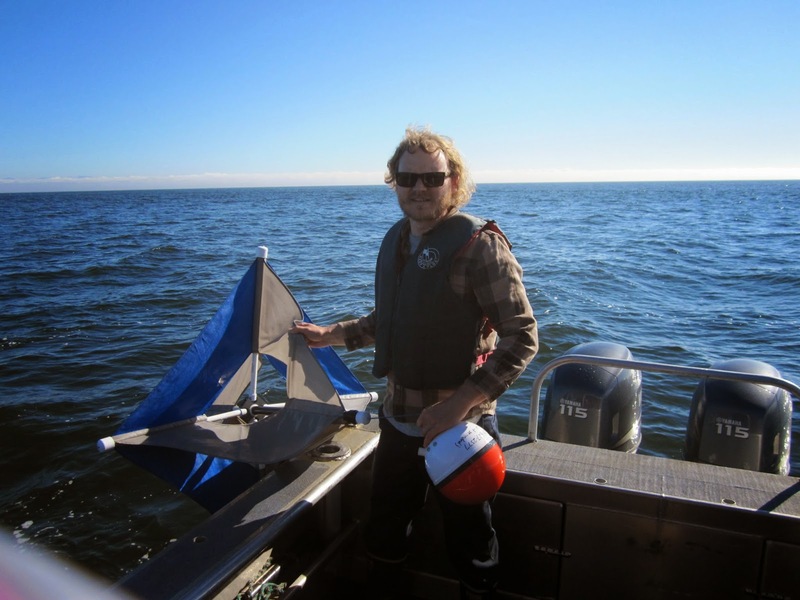 We went to TJ's Boat Tops in Powell River and had Todd Stanhope use our design to make us an enclosure out of outdoor rated cloth and high grade plastic. Here's the results. 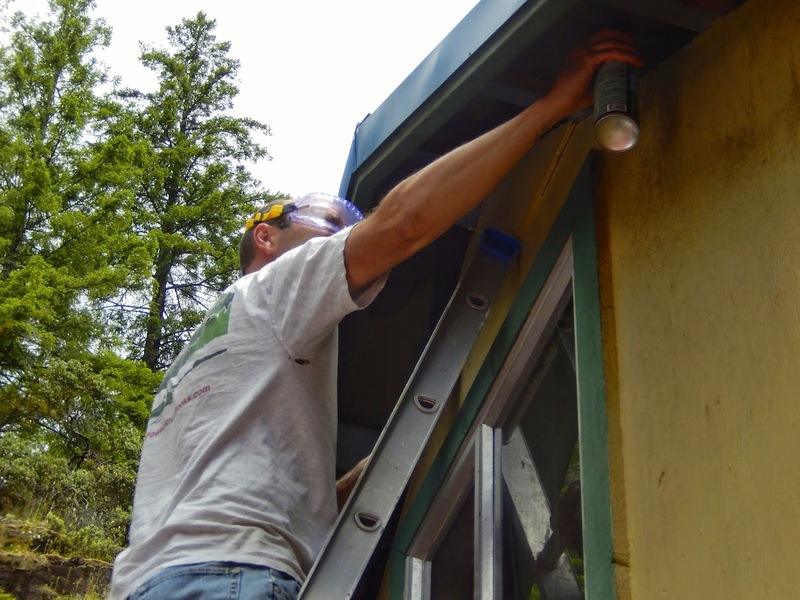 We chose green to match our cabin trim. The two panels are easy to put up and take down if the wind starts to blow too strong. Now when we sit at the table, we have a great view of the lake and Goat Island. The skies around the cabin are quiet. There's nothing sadder than the "empty nest syndrome," even when the nest belongs to a family of Barn Swallows. The first batch of babies didn't make it, so in late July mom and dad Barn Swallow frantically made a new nest under our side porch right in view of our living room sofa. In the June brood there were five babies, four fell to their deaths and the fifth mysteriously died in the nest. That's probably why the pair built a new nest. It's been fun watching the babies grow and mom and dad caring for them. At the end of August, the three babies started flying. Each day they disappeared for longer periods, but returned to roost on the clothes line during the day and to the nest for the night. Mom even continued to feed them until the last day before their departure south for winter in South America. What a difference a week can make. Now it's cloudy and rainy, but last week we took our barge out on a warm sunny day. Sandy beach near Dunn Dock on Powell Lake. Rather than stopping at a logging barge ramp like we usually do, we beached ourselves on a sandy shore. We hiked the shoreline looking for the old road with a rusting winch from early logging days. Winches were used to haul logs and equipment up and down the steep slopes along the shore of Powell Lake. The road was too grown over to explore in our shorts and water shoes. We'll return another day to see if it's still there. Take a hike in the forest and you might find some Orange Jelly Fungus. Orange Jelly Fungus is a very appropriate common name. It looks just like orange marmalade oozing from the cracks in a log. Another common name is Witch's Butter. Dacrymyces palmatus is its scientific name. The website says it's edible, but I think I'll pass and not spread it as butter or jelly on my toast. unless you are absolutely certain of its identity! Wayne and I watched road building being done by Western Forest Products along the southwest shore of Powell Lake. We wondered what it would be like to ride on a brand new road and see the forest before logging begins. After the road work was complete, we took our quads south from Hole in the Wall to the new Western Forest Products logging area called Chippewa South, Chip South for short. The barge ramp and dock are located towards the middle of the new road. To the north, the second growth trees are large and robust. This section of road is about 1.5 kilometres long. To the south, the growing conditions have generated trees of smaller girth. This section is a little over 3 kilometres long. Small blocks will be logged above and below the road in the future. The trees cut down during the road building process were stacked along the road, ready for removal. They will be trucked to the log skid, dumped into Powell Lake, gathered in log booms, and towed to the south end of the lake. From here, they will be loaded onto trucks once again for a short ride to the ocean, and then a long tow to Vancouver. The road was so wide, Wayne and I could ride side by side. That's because it's designed for the oversized or "fat" off-road logging trucks. Here's a YouTube video by clearcutter01 of a Powell River "fat truck" in action. I enjoy making new things for dinner up at the cabin. Recently, I saw an interesting recipe on Crafty Gardener’s blog. I tried it and it was great. Too bad I didn’t grow any of my own zucchini, but two medium store-bought ones did the trick. Saute the onion, zucchini, and mushrooms. Remove any liquid. Remove Italian sausage from casing, crumble, and cook thoroughly. Set all aside to cool slightly. Thinly slice tomatoes. I used Romas from my garden. Remove any excess seeds. Set aside. Grate cheese. I didn’t have enough mozzarella so I added some Colby. I think it added to the flavour. Set aside. Beat eggs and mix in cheese, zucchini mixture, and Italian sausage. Press half of the crescent rolls in the bottom of a lightly greased 9X12 inch baking dish. I got the Pillsbury Grands Crescent Rolls package and half fit perfectly. Spoon the egg, cheese, sausage, and vegetable mixture over the top of the bottom crescent roll crust. Layer the sliced tomatoes on top. Cut the last two crescent rolls in half to make four large triangles. Cover the top leaving a small gap in between for the mixture below to peak through. Bake at 350 degrees for 20-25 minutes, or until the top is golden brown. Cut and serve warm. This made two large servings for our dinner plus two extras for later in the week. I didn’t use any salt or spices, but you can adjust that to your taste. All of the cheese made it plenty salty for us. Since our float cabin doesn't have any flat land, when Wayne and I aren't riding our quads they stay parked on our barge. When we get back from a dirty ride, Wayne hooks up the garden hose to our Hewscraft Ocean Pro's deck rinsing system and gives the bikes a good washing. Fortunately, we live on a fresh water lake. Then, to protect the quads from the elements (sun, rain, snow depending on the season) we purchased a set of QB (Quad Boss) ATV Quad Covers. We chose black, but they also come in woodlands camouflage. The XL size completely covers our Yamaha 450s from top to bottom. They also come in 2XL for larger quads. The cloth is water-repellent and UV resistant. Elastic hems tuck the edges in to keep them from blowing off, but to be extra sure we use several long bungees to make them ultra secure for our windy winter weather. Not only are our quads well protected, but they look neat and tidy parked at the back of the cabin on our floating "garage." 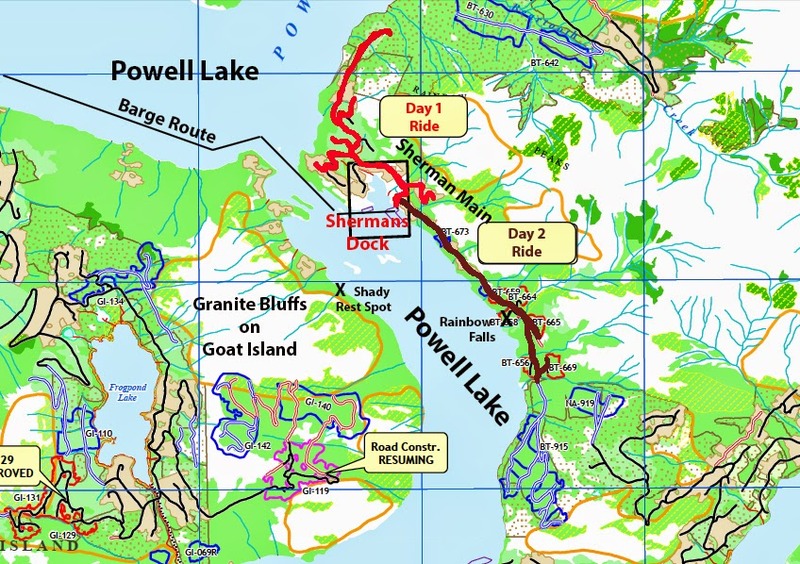 Our next quad ride with the barge on Powell Lake was north to Shermans Main. You get there after going through Second Narrows. The Shermans dock and barge ramp are located next to the historic Rainbow Lodge. It once was a retreat for the local paper mill managers and their guests. Today it's privately owned as the Rainbow Recovery Retreat. We offloaded and took the barge and tin boat to the dock. Even though it was a beautiful calm summer day, we had it all to ourselves. Because we were staying two nights, we broke our ride into two parts. The first afternoon we headed northwest up an older section of Shermans Main. There were large second growth trees, areas of regrowth, and a few new sections of road with open slashes. Powell Lake viewpoint looking south towards the Bunster Hills. Day two we started our ride after breakfast to beat the heat. This time we went southeast along the section of Shermans Main that parallels Powell lake opposite the north side of Goat Island. Again, we found new and old sections of road bordered by trees in different stages of regrowth. One section was littered with huge boulders left behind by Ice Age glaciers that ground their way to the ocean. We even passed the river that becomes Rainbow Falls as it cascades over a granite cliff into Powell Lake. It's signature rainbow in the spray must be where it got its name. When we got back to the barge, the sun was really cooking. We went swimming several times and set up a tarp, but ended up taking our tin boat across the lake to the shady side of Goat Island to read. Just before sunset it was cool enough to return to our home for the night, enjoy a pina colada, and fix dinner. The Eldred River flows through the glacial carved Eldred Valley to the head of Goat Lake. Looking up the Eldred River before it passes through granite chutes. The scouring action of glacial ice over 10,000 years ago created huge granite walls that are favourites with rock climbers. At an unmarked old overgrown logging road opposite a rock wall called Garag-Dur, you can hike down to the river where it passes through narrow water carved granite chutes and holes. Even in warmer summer months, the power of the river is evident. To get here you need to travel on the Goat Main logging road. Access is restricted to nights and weekends, but even then it is is best to contact the Western Forest Products hotline at 604-485-3132 or their office line at 604-485-3100 to find out if there is any active log hauling. You don't want to meet up with a huge logging truck barreling down the narrow dirt road. Goat Main is accessed from Highway 101 via Dixon Road south of Powell River. 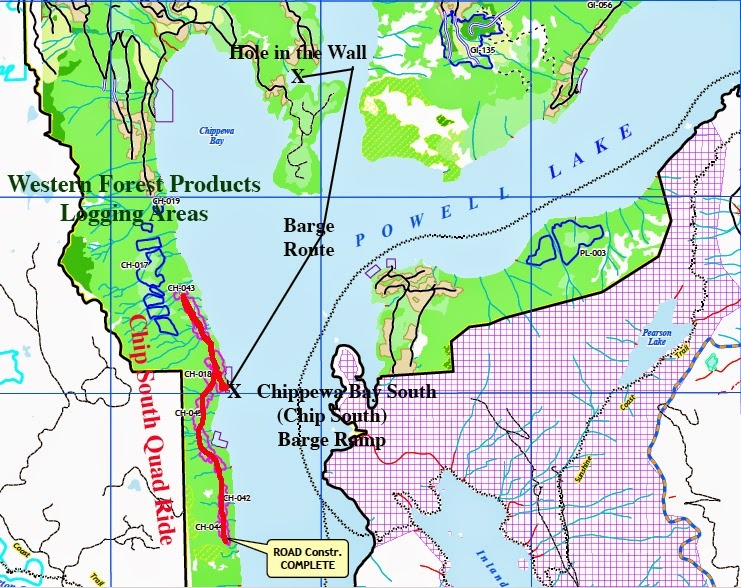 As the mainline winds through the forest, it passes several of the lakes on the Powell River Forest Canoe Route. Many of these lakes have rustic campgrounds that are also accessible by vehicle. Just past milepost 34 on the left hand side of the road there is a trail leading down to the Eldred River. Looking down the Eldred towards the climbers camp.